The average rent nationwide is now €824, a report has found. 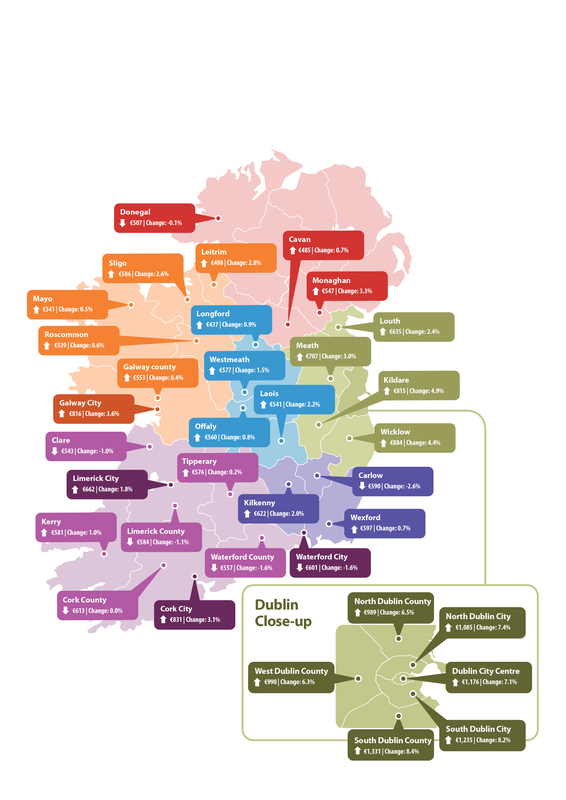 RENTAL RATES WERE on the rise again in the third quarter of this year with the increase spreading outside of Dublin. The year-on-year increase in the average national rent accelerated to 4.8 per cent in the third quarter, up from 4.2 per cent in the previous quarter. This is according to a report from Daft that found this rise is due mainly to trends outside Dublin with rental inflation outside the capital increasing from 0.9 per cent to 1.8 per cent in recent months. The average rent nationwide is now €824. In Dublin, rents are 7.6 per cent higher than last year because of the tight supply with fewer than 1,500 properties available to rent on 1 November, compared to over 6,700 on the same date four years ago. Outside the cities, rents rose by 2.7 per cent in Leinster and 0.9 per cent in Connacht-Ulster but were static in Munster. Commenting on the report today, author of the report Ronan Lyons said that there is an acute shortage of rental accommodation in Dublin. Email “Rents up again as inflation spreads outside Dublin”. Feedback on “Rents up again as inflation spreads outside Dublin”.